Export, preserve, mix, or separate multiple audio tracks in MXF file; MXF to ProRes, MXF to FCP. "I previously had great success with PluralEyes using exclusively ProRes and wav files. But we are running into problems syncing the native camera files, Canon XF100 MXF. Perian doesn't seem to help here. Still getting extraction errors and can't get it to work. I am running Adobe Premiere CS6 (.0.3) with the latest PluralEyes for Premiere on OS X Lion." It is recommended to make a copy of the project first before following these steps. 1. Open the sequence to be synced in the timeline. 2. Select all the video clips in the sequence. 5. Note that this will create new media files on disk (the extracted audio) and will replace the audio in the unsynced sequence with those. However, a guy who tried the Render & Replace workaround still get the error from PluralEyes saying that the files are not supported. Maybe the complex steps cause something wrong. 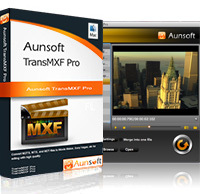 In this case, Aunsoft TransMXF for Mac can be an easiest solution for you to extract audio from MXF to Premiere CS6. Adopting advanced audio encoding technology, the Pro can automatically sync audio waveforms when you load MXF file. Then you can directly view the clips with audio entirely in the preview window. After several times of R&D, now the program can guarantee perfect audio and video sync after source MXF are edited and converted. The whole conversion is time-saving and easy-to-handle. Below is a simple tutorial to convert IMX50 MXF files into MOV for PPro CS6.0.1 with audio. Click "add video" or "add folder" to load source file. For MXF clips in different folder, you can load the parent folder to input all of them instead of imputing clips one by one. You can also directly drag what you need to the program. If your original MXF files are not damaged, the program will automatically load audio counterparts. Batch conversion is available here. Click "Format" drop-down list to locate all the profile; choose the "Adobe Premiere/Sony Vegas -> MOV (AVC) (*.mov) ". 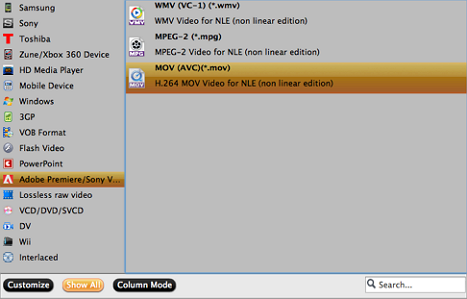 You can also choose WMV and MPE-2 or QuickTime MOV. Click "Conversion" icon that the TransMXF for Mac will extract audio MXF to Premiere CS6. 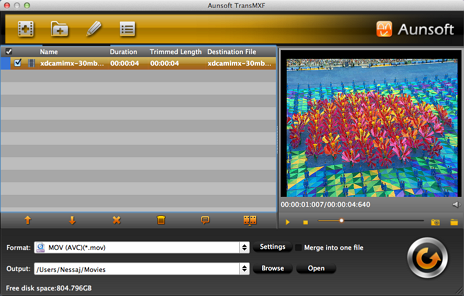 With just a click on "Open output folder", you can locate the export MOV quickly. How to Convert MKV Files with Aunsoft MKV Converter for Mac?